Part II of the Report presents findings through an industry, regional and gender lens, with the aim of providing specific practical information to decision-makers and experts from academia, business, government and civil society. It provides deeper analysis of the overview of results in Part I through Industry Profiles, Country and Regional Profiles and Industry Gender Gap Profiles. In addition, the various Profiles are intended to provide interested companies with the opportunity to benchmark themselves relative to the range of expectations prevalent in their country and/or industry. This User’s Guide provides a detailed explanation of the information contained in the various Profiles and its appropriate interpretation. The first section of each Industry Profile provides an overview of the top trends and disruptions expected to affect the industry in question over the coming years, as well as the timeframe within which these trends and disruptions are expected to require modification to the skill sets of key job functions within the industry. The bar chart represents the share of survey respondents from the industry in question who selected the stated trend or disruption as one of the top three drivers of change affecting business models in their industry. For a detailed description of each driver of change, please see Table 2 in Part I of the Report. The diagram illustrates the expected timeframe within which the top three mentioned trends or disruptions affecting business models in the industry in question are expected to require modification of skill sets of key job functions within the industry—either in order to equip employees with the skills needed to seize new business opportunities created by the trend or disruption or in order to avoid losing competitiveness due to the obsolescence of current employees’ existing skill sets. Due to the different business models and different combinations of trends and disruptions prevalent in each industry, the same drivers of change may be felt differently in various industries. The second section of each Industry Profile aims to provide a consolidated overview of the major expected developments until the year 2020 for the industry’s workforce as a whole and within each main job family in the industry in question. This section provides an aggregate summary of the relative outlook for all occupations and job functions mentioned by survey respondents from the industry in question. All reported averages are simple averages across the job families and functions mentioned, i.e. results have not been weighted by the absolute number of workers employed in any given occupation. For a detailed explanation of each covered dimension, please see the next section, Main Job Families. The table gives a detailed overview of expected developments in the four job families most frequently mentioned by survey respondents from the industry in question. Categorization of occupations and job families is based on the O*NET labour market information system (see Appendix A for details).1 All reported values are simple averages across mentioned occupations within the job family, i.e. results have not been weighted by the absolute number of employees in any given occupation. The individual occupations listed underneath each job family are for illustrative purposes and report the two occupations in the job family most frequently cited by survey respondents from the industry in question. Expected change, 2015–2020: The employment outlook for the job family, converted to a compound growth rate for the 2015–2020 period. The thresholds for the qualitative scale are: +/–1%: “stable”; +/–1% to +/–5%: “growth / decline”; more than +/–5%: “strong growth / strong decline”. Skills stability: The share of an occupation’s five most frequently used skills that have been identified as such by industry respondents both for today and for the year 2020, aggregated across all occupations mentioned for the job family. For a detailed description of each skill, please see Figure 9 and Table A1 in Part I of the Report. Current share of female workforce: The reported share of current female employees for all occupations mentioned as part of the job family, aggregated as a simple average, i.e. not weighted by the absolute number of employees in any given occupation. Ease of recruitment, current: The industry’s perceived current ease or difficulty of hiring competent and qualified employees for a given role, on a qualitative –2 (“very hard”) to +2 (“very easy”) scale, aggregated for the job family as a simple average, i.e. not weighted by the absolute number of employees in any given occupation. The thresholds for the qualitative scale are: –2 to –1: “very hard”; –1 to –0.5: “hard”; –0.5 to +0.5: “neutral”; +0.5 to +1: “easy”; +1 to +2: “very easy”. Ease of recruitment, 2020: The industry’s expected cumulative change in ease of recruitment over the 2015-2020 period, aggregated across roles for the job family as a simple average. The qualitative statement is relative to the previously reported current value. Compensation: The extent to which employment contributes to material living standards. Job security: The risk of job loss and its consequences. Work-life balance: The nature and content of work performed, working-time arrangements and workplace relationships. The third section provides an outlook on the expected evolution of skills demand over the 2015–2020 period. It looks at skills requirements both from an overall industry perspective as well as from the perspective of key skills that will be in demand as part of important new and emerging jobs in the sector. Categorization of skills is based on the O*NET labour market information system. For a detailed description of each skill, please see Figure 9 and Table A1 in Part I of the Report. The stacked bar chart is a diagrammatic representation of overall demand for the industry’s most frequently used skills across all occupations and job families over the 2015–2020 period. The stacked bars are ordered by the overall magnitude of demand for the category of skills indicated and add up to 100%—the industry’s total skills demand profile. The dark blue part of the stacked bars represents the share of skills from the given category for which demand is expected to remain stable. The grey part of the stacked bar represents the share of skills from the given category which is in demand today but for which demand will be on the decline by the year 2020. The bright blue part of the bar represents the share of skills from the given category that is anticipated to be in demand by the year 2020, even though this demand has not yet fully materialized today. 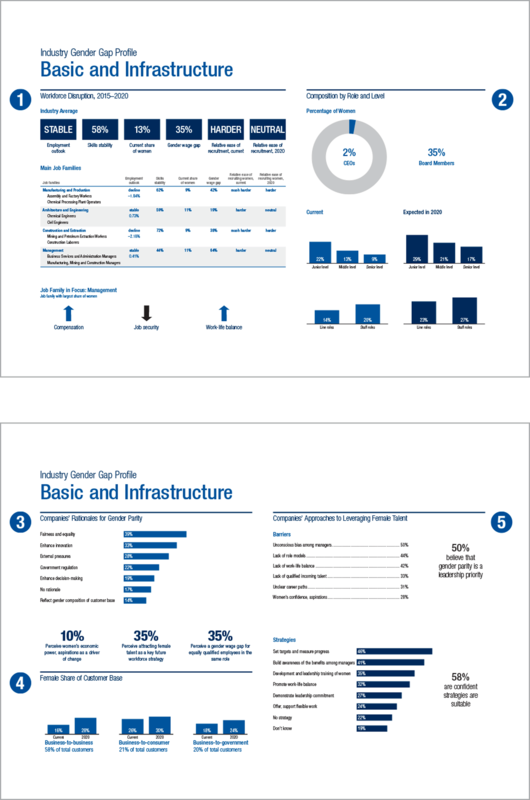 Accordingly, the dark blue and grey parts of the bar chart combined represent the industry’s current overall skills demand profile while the bright blue and dark blue parts of the bar chart combined represent overall skills demand in the industry as expected for the year 2020. Comparing the contours of the two demand profiles and the relative change in length of the various bars provides a visual overview of skills change in the industry. This part of the Industry Profile dives deep into the job family that corresponds to the occupations most frequently mentioned as new and emerging by survey respondents from the industry in question. The left-hand side of the table lists the top-mentioned emerging occupations expected to become increasingly influential in the industry by the year 2020. The right-hand side of the table lists the individual skills expected to be in demand as part of skills profile of these occupations and their corresponding skills bundle. Categorization of occupations and skills is based on the O*NET labour market information system. The final section of each Industry Profile focuses on the measures and strategies for adapting to the top trends and disruptions expected to affect the industry in question over the coming years that companies intend to undertake, as well as the biggest perceived barriers to successfully carrying out these measures and the perceived degree of preparedness prevalent across the industry. The table lists the biggest perceived barriers to preparing the industry’s workforce for disruptive change, as measured by the share of survey respondents from the industry in question who selected the stated obstacle as one of the top three impediments to successful workforce change management faced by their industry. For a detailed discussion of each barrier, please refer to Part I of the Report. To the right of the table is the percentage of respondents who believe that future workforce planning to prepare for disruptive change is either a “somewhat high” or “very high” priority for their organization’s senior leadership. The bar chart represents the share of survey respondents from the industry in question who selected the stated measure as one of the top three future workforce and change management strategies they expect to undertake in their company. 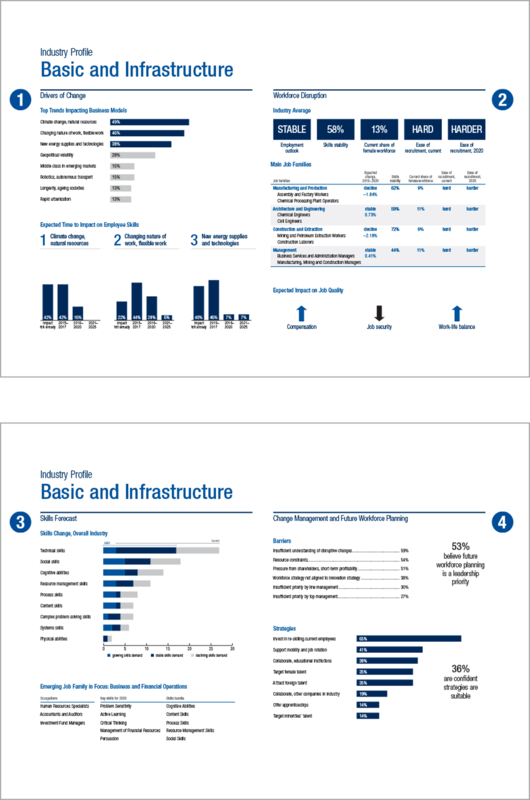 For a detailed discussion of each measure, please refer to Part I of the Report. To the right of the table is the percentage of respondents from the industry who stated that they were either “somewhat confident” or “highly confident” in the adequacy of the selected strategies. The first section of each Country or Regional Profile contextualizes the information presented according to the industry and company size mix of received responses. Overall representativeness of country-level findings should be understood according to the primary country, industry sector(s) and/or company size segments of interest. In addition to 13 Country Profiles, there are two Regional Profiles—ASEAN and GCC. The second section of each Country and Regional Profile aims to provide a consolidated overview of the major expected developments over the 2015–2020 period for the country’s workforce as a whole across key industries, job types and job families. Employment outlook, 2015–2020: The expected employment change for the industry, across all job families, converted to a compound growth rate for the 2015–2020 period. The thresholds for the qualitative scale are: +/–1%: “stable”; +/–1% to +/–5%: “growth / decline”; more than +/–5%: “strong growth / strong decline”. Local share of recruitment, specialists: The current and expected share of strategic and specialist job functions anticipated by respondents from the corresponding industry to be recruited locally in the country. On the one hand, a very low local recruitment share may indicate skills shortages and a very high reliance on expatriate talent that might present an opportunity for the country to build up its talent pool in a targeted manner. On the other hand, a very high local recruitment share might indicate underutilized opportunities to diversify experience and increase knowledge transfer to the local workforce from international experts. Ease of recruitment, overall: The current and expected ease or difficulty of hiring competent and qualified employees across all roles in the industry specified, on a qualitative –2 (“very hard”) to +2 (“very easy”) scale, aggregated for the entire industry in question as a simple average, i.e. not weighted by the absolute number of employees in any given occupation. The thresholds for the qualitative scale are: –2 to –1: “very hard”; –1 to –0.5: “hard”; –0.5 to +0.5: “neutral”; +0.5 to +1: “easy”; +1 to +2: “very easy”. The qualitative scale for “2020” is relative to the current values reported. The table in this section gives a detailed overview of the perceived current and future aggregate ease of recruitment for occupations across three types of jobs: Mass Employment, Strategic/Specialist and New and Emerging. The individual occupations listed underneath each job type are for illustrative purposes and report the occupations most frequently cited by survey respondents across all industries in the country. Categorization of occupations and job families is based on the O*NET labour market information system. The thresholds for the qualitative ease of recruitment scale are the same as for the table above. Values are reported both for the country or region in question as well as for the global sample average, indicating job types in which the country or region may have a comparative advantage as well as those in which recruitment is expected to be more difficult than the world average. The bubble chart visualizes estimated total employment in different job families in the country. The colour of the bubbles indicates the job family’s aggregate employment outlook on the following scale: +/–1%: “Stable”; more than +/–1%: “Growing / Declining”. Insufficient response data available for job families is labelled “N/A”. Estimated total employment by job family is derived from ILOSTAT data, classified according to the International Standard Classification of Occupations (ISCO) and converted to corresponding O*NET job families using the O*NET-SOC taxonomy’s official conversion tables (please see Appendix A for details). No internationally comparable data was available for China and India. Estimates for ASEAN are based on Malaysia, Thailand and Vietnam, and estimates for GCC are based on Saudi Arabia only. Due to the nature of our employment survey and its target audience of large multinational employers, insufficient response data for robust predictions was generally available for the four job families not shown. The third section of each Country and Regional Profile provides an overview of the top trends and disruptions expected to affect industries in the country in question over the coming years and an in-depth look at the top-mentioned trend or disruption across all industries. The bar chart represents the share of survey respondents across industries located in the country or region in question who selected the stated trend or disruption as one of the top three drivers of change affecting business models in their industry. For a detailed description of each driver of change, please see Table 2 in Part I of the Report. This section dives deep into the top-mentioned trend or disruption across industries in the country or region in question. The diagram illustrates the expected time frame within which it is expected to require modification of skill sets of key job types in the country or region—either in order to equip the country’s workforce with the skills needed to seize new opportunities created by the trend or disruption in question or in order to avoid losing competitiveness due to the obsolescence of the workforce’s existing skill sets. The section also reports the trend’s or disruption’s expected overall impact on employment outlook in the country or region. 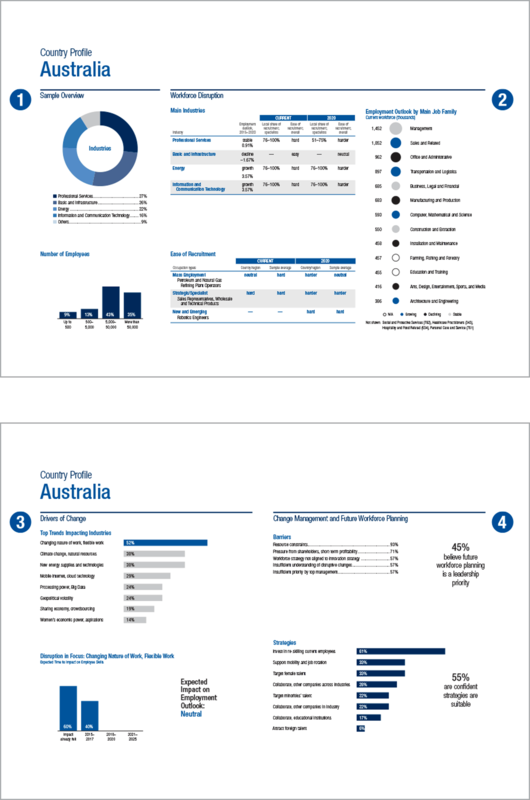 The final section of each Country and Regional Profile focuses on the measures and strategies for adapting to the anticipated top trends and disruptions that companies across industries located in the country or region in question intend to undertake, as well as the biggest perceived barriers to successfully carrying out these measures and the perceived degree of preparedness prevalent across industries in the country or region. The table lists the biggest perceived barriers to preparing the country’s or region’s workforce for disruptive change, as measured by the share of companies across industries located in the country or region in question who selected the stated obstacle as one of the top three impediments to successful workforce change management faced by their industry. For a detailed discussion of each barrier, please refer to Part I of the Report. To the right of the table is the percentage of respondents who believe that future workforce planning to prepare for disruptive change is either a “somewhat high” or “very high” priority for their organization’s senior leadership. The bar chart represents the share of survey respondents across industries located in the country or region in question who selected the stated measure as one of the top three future workforce and change management strategies they expect to undertake in their company. For a detailed discussion of each measure, please refer to Part I of the Report. To the right of the table is the percentage of respondents who stated that they were either “somewhat confident” or “highly confident” in the adequacy of the selected strategies. The first section of each Industry Gender Gap Profile aims to provide a consolidated overview of the major expected developments over the coming years for each of the industry’s main job families and its workforce as a whole, with a particular focus on their implications for the evolution of the gender gap in the industry in question. The table gives a detailed overview of expected developments in the four job families most frequently mentioned by survey respondents from the industry in question. Categorization of occupations and job families is based on the O*NET labour market information system. All reported values are simple averages across mentioned occupations within the job family, i.e. results have not been weighted by the absolute number of employees in any given occupation. The individual occupations listed underneath each job family are for illustrative purposes and report the two occupations in the job family most frequently cited by survey respondents from the industry in question. Employment outlook: The expected employment change for the job family, converted to a compound growth rate for the 2015–2020 period. The thresholds for the qualitative scale are: +/–1%: “stable”; +/–1% to +/–5%: “growth / decline”; more than +/–5%: “strong growth / strong decline”. Current share of women: The reported share of current female employees for all occupations mentioned as part of the job family, aggregated as a simple average, i.e. not weighted by the absolute number of employees in any given occupation. Gender wage gap: The share of survey respondents from the industry in question who stated that there was a wage gap for equally qualified female employees in the same roles for the reported job family. Results have been aggregated as a simple average, i.e. not weighted by the absolute number of employees in any given occupation. Relative ease of recruiting women, current: The industry’s perceived current ease or difficulty of hiring competent and qualified female talent for a given role, relative to the perceived current ease or difficulty of hiring men, on a qualitative –2 (“much harder”) to +2 (“much easier”) scale, aggregated for the job family as a simple average, i.e. not weighted by the absolute number of employees in any given occupation. The thresholds for the qualitative scale are: –2 to –1: “much harder”; –1 to –0.5: “harder”; –0.5 to +0.5: “neutral”; +0.5 to +1: “easier”; +1 to +2: “much easier”. Relative ease of recruiting women, 2020: The industry’s expected future ease or difficulty of hiring competent and qualified female talent for a given role by the year 2020, relative to the expected future ease or difficulty of hiring men, aggregated across roles for the job family as a simple average. This part of the Industry Gender Gap Profile dives deep into the job quality of the industry’s job family that has the largest share of women. The arrows indicate the expected cumulative change in the three dimensions listed over the 2015–2020 period, as identified by survey respondents from the industry in question on a qualitative –2 (“strong decrease”) to +2 (“strong increase”) scale. The three dimensions listed are based on a conceptual framework of job quality under development by the Organisation for Economic Co-operation and Development (OECD). A comparison can be made with the industry’s overall job quality trends, as reported in the Industry Profile. The second section of the Industry Gender Gap Profile provides an overview of the size of the workforce gender gap in the industry today and its expected evolution by the year 2020. The first part of the section reports the current share of female CEOs and Board Members in the industry today. The second part of the section documents reported current and estimated future female representation at junior, middle and senior levels. Somewhat simplified, the bar chart can be understood as a talent pipeline, whereby the share of today’s junior level female talent partially translates to 2020’s share of mid-level talent and today’s mid-level female talent partially translates to 2020’s senior level talent. Large upward or downward divergences from this pattern indicate either expected leakages of female talent leaving the industry or the materialized benefits of intensified promotion, retention and external recruitment efforts. Similarly, the difference between the share of female talent in 2020’s junior level cohort relative to the industry’s current junior level cohort provides a sense of the anticipated longer term evolution of the gender gap beyond 2020. The final part of the section documents reported current and estimated future female representation across line roles and staff roles. A line role is one that directly advances an organization in its core work, including, in particular, the production and sales functions. A staff role supports the organization with advisory and support functions, typically including human resources, accounting, public relations and legal roles. Line managers generally have supervisory authority over those who report directly to them, whereas staff workers’ primary responsibility consists in creating, collecting and analysing information that flows to line workers in the form of advice. Experience in line management functions is generally considered a stepping stone to senior leadership roles within an organization and gender gaps in these roles have historically been especially pronounced. Conversely, certain staff functions, such as human resources, have historically experienced a reverse gender gap. The bar chart represents the share of survey respondents from the industry in question who selected the stated rationale as one of the top three motivations for promoting gender parity in their company. For a detailed discussion of each rationale, please refer to Part I of the Report. This section of each Industry Gender Gap Profile also reports the share of survey respondents from the industry in question who perceived women’s rising economic influence as one of the top three drivers of change affecting business models in their industry, who perceived attracting female talent as one of their company’s top three future workforce strategies, and who reported a gender wage gap for equally qualified employees across key roles in their industry. The three bar charts in this section represent the reported current and expected future share of female clients across business-to-business, business-to-consumer and business-to-government market segments, including situations in which women are ultimately responsible for purchasing decisions, for example, as procurement managers, etc. The share of the corresponding market segment in the industry’s current overall revenue structure is reported at the bottom of each bar chart—providing further information about the dynamics through which trends and disruptions are affecting business models in the industry. Note that the customer base of the three market segments may not sum to 100% exactly in all instances due to omitted other market segments (for example, non-governmental organizations). The final section of each Industry Gender Gap Profile focuses on the measures and strategies for harnessing female talent and promoting workplace gender parity that companies intend to undertake, as well as the biggest perceived barriers to successfully carrying out these measures and the perceived degree of urgency and determination to tackle these issues prevalent across the industry in question. The table lists the biggest perceived barriers to promoting workplace gender parity and leveraging female talent, as measured by the share of survey respondents from the industry in question who selected the stated obstacle as one of the top three impediments faced by women in their industry. For a detailed discussion of each barrier, please refer to Part I of the Report. To the right of the table is the percentage of respondents who believe that tackling gender parity issues and closing the industry gender gap is either a “somewhat high” or “very high” priority for their organization’s senior leadership. The bar chart represents the share of survey respondents from the industry in question who selected the stated measure as one of the top three strategies for promoting workplace gender parity they expect to undertake in their company. For a detailed discussion of each measure, please refer to Part I of the Report. To the right of the table is the percentage of respondents from the industry who stated that they were either “somewhat confident” or “highly confident” in the adequacy of the selected strategies. 2 Organisation for Economic Co-operation and Development (OECD), Job Quality, Directorate for Employment, Labour and Social Affairs – Employment, Labour and Social Affairs Committee, 16-17 October 2014. 3 See: Catalyst, Buying Power: Global Women, 2015, www.catalyst.org/knowledge/buying-power-global-women; Silverstein, M. and K. Sayre, “The Female Economy”, Harvard Business Review, September 2009.